Then a friend introduced me to the MELT Method. The MELT Method (MELT) is a simple self-treatment designed to help you stay healthy, youthful, and active. MELT focuses on hydrating your connective tissue and easing any pain you may have in your body. This connective tissue is just below the surface of the skin and is very often overlooked. This is a full-body method that can be customized to your particular needs– from improving performance to eliminating chronic pain. MELT is for anyone who wants to slow down the aging process and live a longer and happier life. MELT is a great option for those in their 40s and older who want to stay active, mobile, and independent. MELT is also for active younger adults and athletes who want to maintain a fit, toned body and achieve optimal performance without getting worn down. MELT is truly for everyone and anyone! MELT targets the connective tissues of your body to create a strong and flexible body. You can even see and feel results after just one session! Why should I try MELT? Day-to-day living creates tension within our bodies, even if you aren’t aware of it. Physical stressors can range from simply sitting at a desk to climbing a mountain. Carrying children and heavy bags creates trapped tension in your body, as does even the gentlest form of exercise. Some less-known stressors that can build tension in the body are emotional, mental, and environmental stressors such as processed foods, medications, environmental toxins, and daily worries. Even the smallest of stressors can create a domino effect that begins with aches and stiffness and can lead to common health issues such as neck and low back pain, headaches, insomnia, digestive problems, and injury. This domino effect then accelerates aging and chronic health problems. However, with the MELT method our bodies learn how to function at a more optimal, and comfortable level. Changes in posture, flexibility, energy, mood, and performance are some of the benefits you can see even in the beginning stages. How does MELT reduce pain? 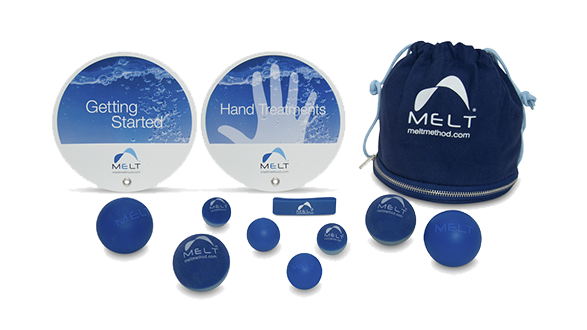 In a nutshell, the MELT Method uses soft roller and hand/foot balls to gently stimulates cells and tap into the connective tissues of the body. This will allow your body to produce more ground fluid (also known as joint lubrication), and then push these fluids into the areas of the body that commonly hold tension from the day-to-day stressors I mentioned above. Essentially, MELT rejuvenates tissue hydration and releases the tensions of life that get trapped in our bodies. MELT is unique in that no other proactive approach directly treats the connective tissue—including nutrition, exercise, yoga, meditation, and vitamins! How can I try MELT? Instructional DVD’s are available so you can learn the Method at home. The techniques are quite simple however I’ve noticed that many people need a little help getting it just right so they can experience the full benefit of the technique. 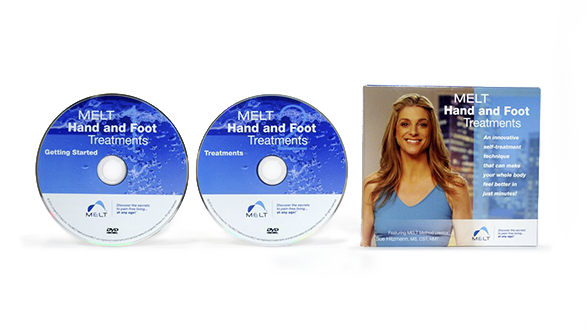 I offer regular group classes as well as affordable private sessions to ensure you’re performing the techniques properly and receive the full relief MELT can provide. View my class schedule here. I’ve listed all my classes including cooking classes and any wellness events I’m attending. I look forward to meeting you there! MELT products are included in many of my classes or can be purchased below. If you prefer privacy and individual attention book your private session here. Private sessions are perfect if you’re dealing with a specific condition as I can suggest modifications to the technique. I can also ensure you’re performing the techniques correctly so you receive the full benefit of MELT. You can purchase MELT Method products from me in classes or by using the links below. I can’t wait to introduce you to this transformative technique!